The Blues are now fifth, trailing Arsenal on goal difference in the bid for Champions League qualification, after a fifth loss in 12 Premier League games. Yes, Chelsea lost in humiliating circumstances at Bournemouth, almost a year to the day since a 3-0 home defeat to the Cherries. But Maurizio Sarri’s side are in the February 24 Carabao Cup final against Manchester City and play Sweden’s Malmo in the knockout stages of the Europa League. The tournament winners qualify for the Champions League. The Blues were unbeaten in their first 18 competitive games under Sarri, whose appointment came late; it was his predecessor Antonio Conte who began pre-season as Chelsea boss before being sacked. Sarri apologised to the Chelsea supporters after another inept performance, swiftly following his angry criticism of his Chelsea players after the 2-0 loss at Arsenal. Chelsea’s ponderous possession-based football has appeared vulnerable to a defeat such as this for some time – the undefeated sequence masked many issues – but few expected it to happen at Bournemouth. 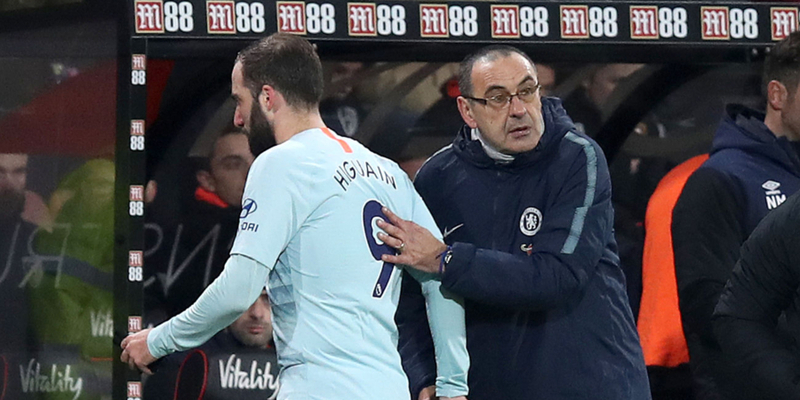 Sarri, who held a lengthy dressing room inquest at Bournemouth, has time and again questioned the mentality of his players and that he cannot motivate them. That is a bizarre admission when it is his role. Chelsea appear lacking in leaders and Eden Hazard blows hot and cold, with his long-term future in major doubt. Sarri is more than culpable for the poor results and inconsistent performances. His ‘Sarri-ball’ tactics attracted admirers at Napoli, but few have followed here. Jorginho leads the passing statistics in the Premier League (2,136; not one assist) as the fulcrum of a 4-3-3 formation which has seen N’Golo Kante played out of position on the right side of midfield. When Jorginho struggles, Chelsea do. Yet Sarri has shown a stubbornness and inflexibility, offering no plan B while his substitutions are predictable. He has admitted new signing Gonzalo Higuain needs to start scoring quickly, but a lack of goals are only part of the team’s problems. Why not play Callum Hudson-Odoi more? He may fare better than Pedro, Willian and others. Perhaps past successes – Conte called the title win in his first season a “miracle” after the Blues finished 10th the year before – covered up systemic failures. Chelsea head coaches or managers, whatever their title, are not solely responsible for recruitment. Michael Emenalo’s departure in November 2017 means transfers are a large part of director Marina Granovskaia’s remit, with recommendations from the head coach considered. A director of football/technical director would ease the considerable workload on Granovskaia and may also help with joined-up thinking to promote academy players to regular first-team action. Chelsea owner Roman Abramovich has tended to wield the axe when Champions League qualification prospects are slim. It would seem strange for that method to change and to show patience with a 60-year-old former banker who is yet to win silverware. Luis Felipe Scolari and Andre Villas Boas were both fired in their first seasons, but both had more pedigree than Sarri. Stick or twist, it would seem Chelsea have plenty of difficult moments ahead.